One of the things which new aquarists often find difficult is figuring out how much to feed their fish. As a rule fish will always want more, and many people worry when they see their fish cluster at the surface that this means they're underfeeding them. In fact, though underfeeding can occasionally be a problem, overfeeding is much more common and can become dangerous much more quickly. Some fish will stop eating when they've had enough, but the majority will carry on instinctively consuming more food, putting stress on overloaded digestive systems. This can lead to bloating and illness. If your fish struggle to swim properly or to control their position in the water after you've fed them, you're feeding them too much. A swollen stomach can press on the swim bladder, the organ which controls a fish's buoyancy. Although they may enjoy extra food, fish clearly don't enjoy being disabled like this. Although your fish may spend most of their day looking for bits of food in various parts of the aquarium, or nibbling at your plants, you should, as a rule, feed them only as much as they can consume within one minute. This can be delivered all in one go or split into two daily meals. Try to establish a regular pattern of feeding times as this will help your fish to feel more secure and confident about the availability of food. The most serious and most frequent problem caused by overfeeding is pollution. If your fish don't consume all the food in the tank, micro-organisms will. It will decay to produce ammonia which can build up to poison your tank. Good filtration can help to get rid of this and your tank's natural ecosystem can deal with it to an extent, but it's possible to overload either, and it's better not to create the problem in the first place. In an ideal world, you would not buy fish with the potential to grow too big for your aquarium, but the fact is that many people do. What's more, even if you do have space for them at full adult size, they'll probably be happier when they're smaller and effectively have more space to move around. For this reason, many aquarists try to restrict the growth of their fish by restricting feeding. This makes more of an impact with some species than others. Loaches, for instance, will normally grow slowly anyway if there are several of them in a tank, because they will pick up on pheromone signals from the largest; whilst sharks can double or half their natural growth rate according to the availability of food. 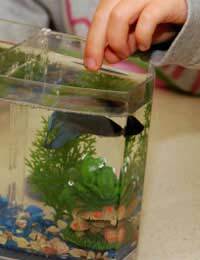 It's not necessary to starve your fish in order to restrict their size this way. In most cases, if a fish is growing rapidly, the quantity of food supplied can be reduced by a third without any ill effects. Vegetarian fish can supplement their diet with algae and plants, but you should be a little more careful with purely carnivorous fish, who will have fewer back-up sources of nutrition. Sometimes fish will fail to eat properly because they are ill or under stress. If you have an established feeding regime, and if your other fish are okay, do not try to resolve this by adding more food. In the first instance, after taking into account any other necessary medical intervention, you should give the troubled fish two to four days to snap out of it. If this doesn't work or if it is getting noticeably thin (ribs showing, hollowness around the belly) you should try hand feeding with particularly tasty foods, or you should place it in quarantine and supply it with a high protein diet. The best way to approach getting fish feeding right is to start with small quantities - just a pinch of flakes or a teacupful of water with live food in it - and see how your fish respond. Don't feel you're letting them down by not giving them as much as they want. If food is properly rationed, they'll be much healthier and happier in the long term.